Multi-Domain Operations (MDO) describes how the Army contributes to the joint force’s principal task as defined in the unclassified Summary of the 2018 National Defense Strategy of the United States of America: deter and defeat Russian and Chinese aggression in both competition and conflict. To do either, the Army must have a viable warfighting concept. The MDO concept is designed to defeat our potential adversaries’ ability to build layers of stand-off that generate political separation among the United States and its allies, physical separation of the joint force in time and space, and functional separation of the joint force and partners. Furthermore, the U.S. has generally enjoyed domain dominance in operations over the last 15 years. That advantage will not be guaranteed in the future. To improve and increase their layered stand-off, Russia and China have increased military and technological investments in all domains challenging both our dominance and our ability to achieve a tactical advantage. Thus, the Army needs an expanded battlefield perspective that allows commanders and staffs to think through and visualize the evolving nature of warfare in all domains, in conflict and competition, in order to retain dominance and flexibility. In the future, the Army will have to penetrate the multiple layers of stand-off. To do so, the Army must optimize domains at decisive spaces. Currently, the Army overmatches its enemies through the episodic synchronization of domains during an operation. Future conflict against a near-peer adversary capable of challenging our domain dominance negates this limited approach. Optimizing the employment of MDO offers a solution to the challenges our near peers pose. In MDO, Army forces, as an element of the joint force, compete in all domains below the threshold of armed conflict; when necessary, engage in armed conflict to penetrate and dis-integrate enemy anti-access and area denial systems; and exploit the resultant freedom of maneuver to achieve strategic objectives (win) and force a return to competition on favorable terms. A&M: Why is MDO so important and necessary today? LTG Wesley: As we assessed our future ability to address the adversary’s impact, we identified a potential problem: adversary stand-off. Multi-Domain Operations provides a fundamentally different way of looking at the problem of stand-off. Our adversaries have spent the last 15 years investing in tactical, operational, and strategic stand-off capabilities. That investment is a direct result of our adversary’s determination that engaging the United States Army in close combat results in an undesired outcome. With the stand-off problem, the question becomes: how do we prevent adversaries from creating stand-off prior to armed conflict during the competition periods — and how might we penetrate that stand-off during conflict? The essence of the Multi-Domain Operations concept allows us to reduce the stand-off challenge in competition left of conflict, to penetrate the adversary’s remaining stand-off, to dis-integrate the enemy systems that enable it, to exploit the penetration, and then to return to competition. Therefore, the operating logic of MDO is compete, penetrate, dis-integrate, exploit, and re-compete. When dealing with a stand-off challenge, one must understand that we require reach — the distance and duration a unit can successfully employ military capabilities. Therefore, the primary challenge is to get inside and dismantle the adversary’s stand-off capability to increase reach unhindered. A&M: Please speak to some specific ways in which the various domains (land, sea, air, space and cyberspace) will be integrated. LTG Wesley: MDO requires practitioners to understand the interdependencies of the domains. While the degree to which each domain is involved depends on the specific challenge posed based on our adversary’s capabilities, all domains will be in play. Cyberspace capabilities may be employed offensively to destroy or disrupt an adversary’s integrated air-defense network in one operation, when in another operation cyberspace capabilities may be used for reconnaissance to identify types of adversary systems. The principal idea behind MDO, however, is focusing on how capabilities in each domain enable actions in other domains and how the alignment of multiple domains creates overmatch; it is not a singular capability focus idea. What we are trying to achieve is the idea that the net effect of capabilities employed across all domains is greater than the sum of the parts. Dominance in each domain cannot be ensured; therefore, it is important to align our capabilities within each domain within a decisive space. This allows us to leverage advantages we must create in order to penetrate and dis-integrate adversary stand-off, allowing us to exploit the decisive space. The advantage of the MDO approach to warfare is an expanded perspective of competition and conflict periods in all domains. A&M: What would you say are the greatest current challenges to achieving the goals of MDO? LTG Wesley: The greatest challenge in MDO is command and control (C2). If you think through implications, you realize multi-domain C2 is the preeminent challenge due to the difference in the way the domains are controlled and influenced. Each domain is stewarded by various echelons and different services. This often results in difficulty when attempting to integrate domains due to the authorities granted or not granted. Cyber is one example where the authorities have historically been retained at very high levels. Joint strike fighters are managed or operated by different services, and if someone is trying to line up all five domains in an acute manner — as a target of opportunity — one can imagine that it is very difficult to do that. We execute MDO today; however, we do it episodically because of the challenge of lining up resources in the various domains. Attempting to align all of the actions from air to ground in order to have a consolidated effect can sometimes take extended periods to ensure you have a synchronized effort. This shows why the biggest challenge of MDO is multi-domain C2. A&M: Are there any plans to get all the services collaborating in a joint effort in MDO? What are the challenges in bringing that about? LTG Wesley: The U.S. Army Training and Doctrine Command has been collaborating on this particular topic for at least three years or so, particularly between the U.S. Air Force and the Marine Corps. Most recently, over the course of the last year, we conducted four wargames that were intended to solve specific problems that faced the joint force in a multi-domain operational environment. The Army plans to roll out MDO 1.5 for the Association of the United States Army’s national event in October 2018. MDO 1.5 is a follow-on concept to a multiservice white paper titled Multi-Domain Battle: Evolution of Combined Arms for the 21st Century, 2025-2040 (Version 1.0). MDO 1.5 expands on MDB 1.0 and serves as the Army’s effort to describe how we think we fit in to the joint force and what we think we can provide to the joint force. The next step in developing this concept is MDO 2.0. We have talked to the Marine Corps and the Air Force about pursuing MDO 2.0 over the course of the next year. Future operations will require us to integrate all services and all domains. MDO 2.0 can be an effort to create either a multiservice document or potentially the preliminary aspects of a joint document. A&M: What domains do you think present the greatest challenge for the military at this time? 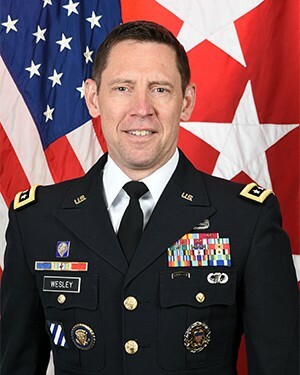 LTG Wesley: The challenge is not a particular domain; aligning capabilities and authorities to the appropriate echelon is. Some of these domains transcend not only tactical areas but also regions resulting in effects worldwide. Authorities that are often retained at varying levels cause immense challenges. Attempting to change that paradigm and ensure that authorities are pushed down to the right level will ensure that we achieve the correct tactical, operational and strategic effect. A&M: What impact do you think the implementation of MDO might have on existing military units or constructs? How likely is it that MDO will make any units obsolete? LTG Wesley: The implementation of MDO will be determined by continued experimentation, which will drive concept refinement. Based on the current concept, there is very little that may become obsolete. Roles don’t decrease; they expand. While this evolution may change some aspects of warfare, many will stay the same. The land component — the land domain — will always be relevant. “Shoot, move, communicate” will always be relevant. The aspects that may change involve the expansion of roles in terms of operations in all domains. We could see units take on different forms by resizing, reorganizing, shrinking or expanding. Combat arms forces will remain, but their organization and capabilities will change. We are going to continue to see the U.S. Army migrate capabilities downward to tactical units. That has happened for centuries. The capabilities will continue to migrate down to tactical units as the concept evolves to domain integration at the lowest realistic level. This migration is not to say that tactical units are getting overwhelmed with more requirements, but it is providing the tactical units enough capabilities to maneuver semi-independently during the fog and friction of combat operations. Additionally, we will likely be restoring the echelons above brigade (EAB) ability to conduct integrated campaigns. In many ways over the last 20 years, EABs have been reduced to headquarters elements, whereas in the past, EABs would have conducted campaigns or campaigning operations as a formation. The intent is to work toward improving campaigning capability. Every echelon will have roles and responsibilities in a Multi-Domain Operational environment, and they will integrate domains that extend well beyond the Army while touching all aspects of the joint force.